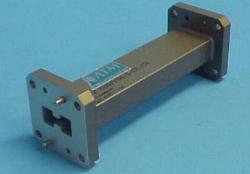 ATM manufactures Waveguide to Waveguide Adapters covering a full frequency range for Rectangular and Double Ridge Waveguides, with multiple flange configurations available. 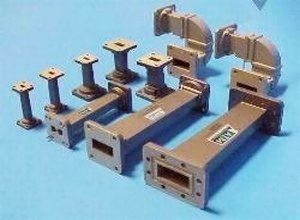 We offer a wide variety of waveguide transitions ranging from standard rectangular waveguide adapters in overlapping bands to custom waveguide adapters spanning multiple bands. 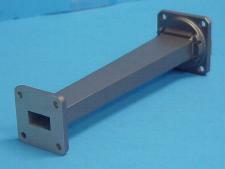 Please call us to discuss your waveguide transition adapter requirements with one of our design engineers. Additional Models Available. Please Consult Factory. * It is possible to change the flanges on the standard model, but the order is important. The first flange corresponds to the smaller WG size and the second flange corresponds to the larger WG size. To change the length of a standard model consult factory for more information. * It is possible to change the flanges on the standard model, but the order is important. The first flange corresponds to the double ridge WG and the second flange corresponds to the rectangular WG. In order to change the length of a standard model consult factory for more information. * It is possible to change the flanges on the standard model, but the order is important. The first flange corresponds to the smaller double ridge WG and the second flange corresponds to the larger double ridge WG. In order to change the length of a standard model consult factory for more information.